The Albermarle Sound, the Pamlico Sound, the South River; these estuarine waters are an important feeding and nesting habitat for fish, birds and other wildlife. Most of the seafood that ends up on your plate spends part of its life in our estuaries so it makes sense to protect these habitats. But as beneficial as estuaries are for recreation and the economy, they are also very fragile. Today on the Down East Journal, we focus on just one of the many factors that can alter an estuarine ecosystem. Time to put your thinking caps on as we delve into the topic of ocean acidification. Recent studies have shown that acidic environments affect the calcification of shellfish and can impair an organism’s ability to process environmental and biological cues. Associate Professor of Marine Environmental Science at the Institute of Marine Sciences in Morehead City Dr. Michael Piehler says acidification can be driven by many different aspects. Dr. Piehler says a long term trend in carbon dioxide levels has led to an increase in ocean acidification on a global scale. But estuarine waters in eastern North Carolina are also highly susceptible to natural fluctuations in acidity. Algae that grow in estuaries take CO2 out of the water, which raises the pH. When the pH level drops, it also affects the water chemistry. For example, when the acidity increases, the concentration of calcium carbonate goes down, weakening shellfish, coral and crustaceans. Meaning acidity affects different species in different ways. A study by Northeastern University professor Justin Ries found that eastern oysters, which are common along our coast, responded negatively to acidic environments. Their shells became frail and researchers believed that would make them more prone to predation. Crabs, on the other hand, responded positively to acidic conditions and were able to form a harder shell. To test this hypothesis, Dr. Piehler and several other marine scientists set up an experiment in which crabs and oysters were grown in a range of acidities. Dr. Piehler says the normal pH in sea water is around eight, so anything less than that would be considered acidic. Both the crabs and oysters were grown for 71 days in the varied levels of acidification. Then, the predation trials were set to begin. Based on past research, the group knew that oyster shells would be weaker and the crabs would be stronger. 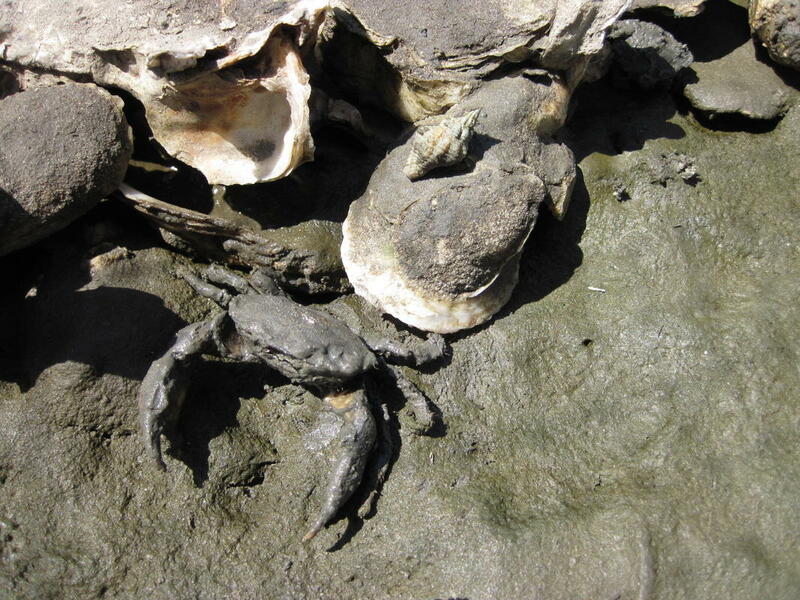 They predicted that the crabs would consume more oysters because they were easier prey. But, that’s not what happened. So, crabs in high acidic environments are basically disoriented. Any calcification advantages crabs experience are overwhelmed by the inability to sense their prey. This experiment gives Dr. Piehler and his team of researchers a better understanding of the dynamic estuarine ecosystem and the affect acidification has on aquatic wildlife. If carbon dioxide emissions into the atmosphere continue to rise, Dr. Pieler says the acidity of our oceans and estuaries could increase too, exacerbating the current fluctuations in pH levels along our coast. But, it’s also possible that crabs and oysters can adapt to future ocean acidification, though, that’s unclear at this time.